Zingy ginger beer and zesty lime flavors combine to create a multi-dimensional flavor profile. We honed the sophistication of the Mule while celebrating its approachable effervescence. Our rendition is earthy and honorably authentic. Your only problem will be convincing anyone that this in not vodka-based. Made From Other Than Standard Orange Wine With Natural Flavors, and Caramel Color. Fill 14 oz. Copper Mug with ice. Pour 4 oz. 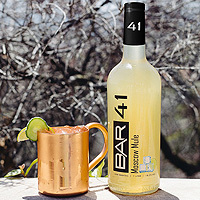 Bar41™ Moscow Mule Cocktail in the mug. Add 1.5 oz. of Club Soda. With an empty shaker, pour the contents of the mug into the shaker, and then back into the mug 3 times, so the ingredients mix but do not agitate the carbonation from the soda. Garnish with lime on the rim.